Calcium nitride is the inorganic compound with the chemical formula Ca3N2. It exists in various forms (isomorphs), α-calcium nitride being more commonly encountered. 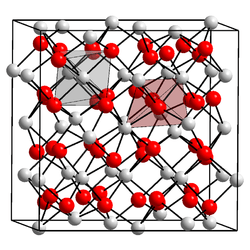 α-Calcium nitride adopts an anti-bixbyite structure, similar to Mn2O3, except that the positions of the ions are reversed: calcium (Ca2+) take the oxide (O2−) positions and nitride ions (N3−) the manganese (Mn3+). In this structure, Ca2+ occupies tetrahedral sites, and the nitride centres occupy two different types of octahedral sites. ↑ Eagleson, M. (1994). Concise Encyclopedia Chemistry. Walter de Gruyter. p. 160. ISBN 3-11-011451-8. ↑ Heyns, A. (1998). "The Vibrational Spectra and Decomposition of α-Calcium Nitride (α-Ca3N2) and Magnesium Nitride (Mg3N2)". Journal of Solid State Chemistry. 137 (1): 33–41. Bibcode:1998JSSCh.137...33H. doi:10.1006/jssc.1997.7672.